These dancing candles are so realistic that practically indistinguishable from traditional burning candles. With one remote control, You could control all our candles. 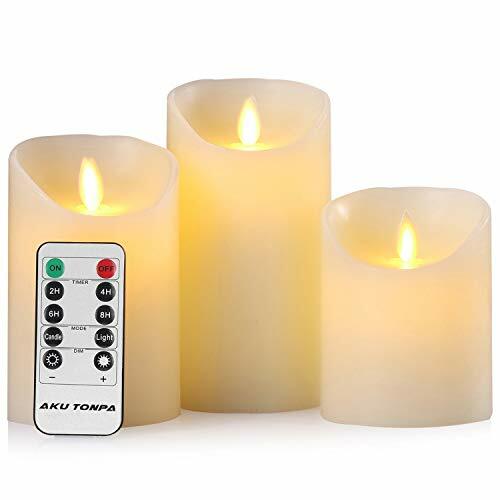 10-key remote timer, once the timer is set, the candle comes on at the same time each day and stays on for either 2 hours/4 hours/6 hours/8 hours. Powered by 2 AA batteries (Not included) per candle, the expected battery life is of approx 200 hours (high-grade battery required). The lifetime of LED Lamp is 50,000 hours. These decorative moving wick candles can be widely applied to birthday, Christmas, home decorations, bars, hotel, parties, holidays, wedding, or other occasions. If you have any questions about this product by Aku Tonpa, contact us by completing and submitting the form below. If you are looking for a specif part number, please include it with your message.